This fairytale fantasy film, written and directed by French surrealist poet Jean Cocteau (1889 – 1963) is being shown as part of the Barbican’s current art exhibition – The Surreal House. Cocteau is credited with introducing Surrealism into French cinema through his films, all of which he wrote and directed, which also influenced the upcoming French New Wave. Beauty (Josette Day) is the Cinderella to her two sisters, Félicie (Mila Parely) and Adélaïde (Nane Germon) who, effectively stand in for Cinders’ ugly step-sisters in this film, for, though they are both pretty, they are too vain and selfish to be considered real beauties. Beauty’s brother, Ludovic (Michel Auclair) has a handsome friend, Avenant (Jean Marais) who repeatedly proposes to Beauty, only to be told she ‘can’t leave her father.’ Her father, (Marcel Andre) a kindly white haired gentleman who looks as though he’d just stepped out of a painting of the Dutch Masters in his pilgrim like garb, is ruined, as the ships he has been counting on have been plundered, destroying any hope of gain in his business. This angle inadvertently lends the story a topical wrinkle, as creditors arrive to remove the furniture. In an attempt to salvage what remains of his dwindling fortunes, Belle’s (Beauty’s real name) father travels to another locale, asking his daughters what they would like him to bring them on his return. Although her sisters ask for jewels and fine garments, Belle innocently requests a single rose, as ‘none grow’ where they live. One night, on his return journey, Belle’s father loses his way in a heavy fog and winds up at the mysteriously ‘deserted’ castle of the Beast, who only appears when he plucks a rose for Belle, furiously roaring that the old man has stolen, ‘that which he loves best,’ in return for which he demands one of the merchant’s daughters. Belle volunteers to go to the Beast, as it is her request which has brought down his wrath on her father. However, on seeing Beauty, Beast is immediately reminded that beneath his horrible exterior he is, at heart, not only a man, but a prince. To say this black and white film was cinematically speaking, way ahead of its time would be a huge understatement, as its’ intermittently voyeuristic feel, achieved through thoughtfully still moments of camera time in which we are very aware, as if our senses have been heightened like that of a beast’s, that the Beast is indeed, watching the proceedings from afar, offer a slightly uncomfortable ‘fly on the wall feeling,’ not something one might expect in a fairytale, especially to such an atmospheric extent. In other scenes when the camera remains intentionally stationary, we are reminded that nature looms larger than anything, as is made majestically obvious in a scene when Beauty wanders out among the tall trees on the wooded grounds of the Beast’s monstrous castle, her hair long and flowing, white gown trailing, seeming progressively smaller and smaller alongside of the ancient trees the further she travels from the camera, which is aligned with our, by then, distant vantage point. When the camera does move, once it is in on the Beast’s turf, it moves very slowly, as human characters naturally, proceed with caution. This device allows viewers to note each and every oddity in this fantasy land, from the crackling fire in the Beast’s eerie castle, which seems much louder than usual, another sense heightening device, to the eyes of the mantelpiece busts suspiciously watching every movement. Beast’s world, as Cocteau sees it, is a land of deep contrasts – a gleaming white gown against the deadly black of night, pallid arms extending from dark walls bearing candelabras of glowing candles, ashen rings round shifting eyes in wooden fireplaces, in turn, round crackling fires. This positive/ negative juxtaposition is central to the story itself, with Beast visibly struggling against his animal nature, Beauty facing her fear and learning to surmount it and her diminished father rising above his unfortunate circumstances. But this story is much more than a simple moral tale, for it is riff with subconsciously activated surrealism, best expressed through its’ magical aspects, which Cocteau takes full advantage of. For example, we never lose sight of the fact that Beast’s horse, Magnificent has special powers as the sparkle of his coat jumps off the black and white screen. Similarly, beautifully enacted gently slow motion pacing in some brief, but unforgettable scenes, such as Beauty’s frantic rush into the castle following a hiatus Beast has kindly granted her, convey her moving as though awakening from a deep sleep, which of course, Beauty is doing and helping Beast to do as well. Psychologist Carl Jung might have approved of both this story and film as well, for the Beast’s sides reflect his anima and animus, sometimes all rolled into one big indecipherable mass. It’s unclear whether Beauty actually represents Beast’s anima, or feminine side, but it’s a certainty that her appearance causes him to remember his humanity, starting his ascent from the depths of his ID, a concept of the darker aspects of the self that Sigmund Freud, the ‘father of Psychoanaylis’ dreamed up. 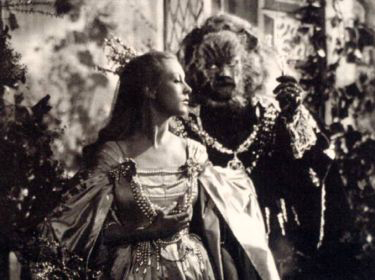 Miraculously, Jean Marais’ silent acting as the Beast is so moving that it’s almost painful to watch – a real tribute to his acting skills and Cocteau’s soulful directing. Josette Day is both lovely and sensible as the natural princess who is so because her heart is true and her priorities in order – in short, no fool. 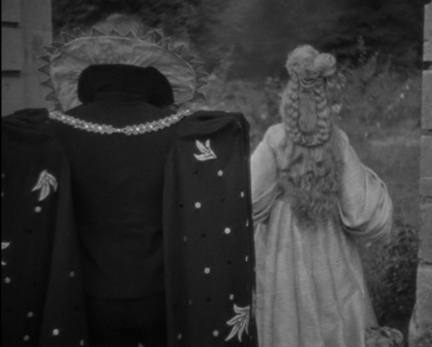 Cocteau managed to weave all this magic without the use of special effects as we know them today! Cupid may be known for shooting arrows, but in this film, Beauty’s brother Ludovic playfully pushes his friend, Avenant, causing him to misguide an arrow which threatens to pin one of Beauty’s evil sisters’ skirts to the ground – fitting as she is earthbound, enamoured of riches and royalty, and by the end of Cocteau’s ethereal big screen adventure, we realise that Anenaut is similarly bound to earthly treasures, which he prizes above all, rather than the heavenly ones of Beauty and her beastly prince.